This article may cause you to rethink your training zones as a triathlete. Relatively recently, Dr. Andrew Coggan (the guru of bike power meters) came up with some new training zones to replace the original zones he had created several years ago. The original zones included recovery, endurance, tempo, threshold, VO2 Max, anaerobic capacity, and Neuromuscular power. The way a lot of people thought about these former training zones were specific energy systems for each zone. However, the truth is that energy systems in the body work together throughout the whole continuium. The percentage of energy produce from each one differs at various levels of exercise, which is why Dr. Coggan came out with new iLevels. 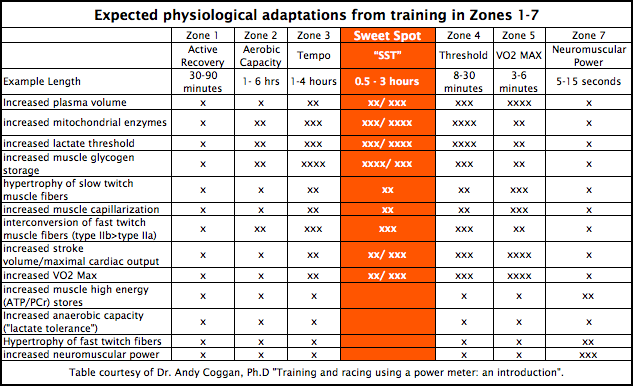 These new zones are based on the power curve an individual athlete instead of generic guidelines. These new zones are now recovery, endurance, tempo, sweet spot, FTP, Functional Reserve Capacity/FTP (FRC/FTP), FRC, Pmax/FRC, and Pmax. As a triathlete, you don’t really need to concern yourself too much with Pmax/FRC and Pmax intervals, since races never demand a sprint to the finish of the bike leg, since you obviously have to run afterwards. 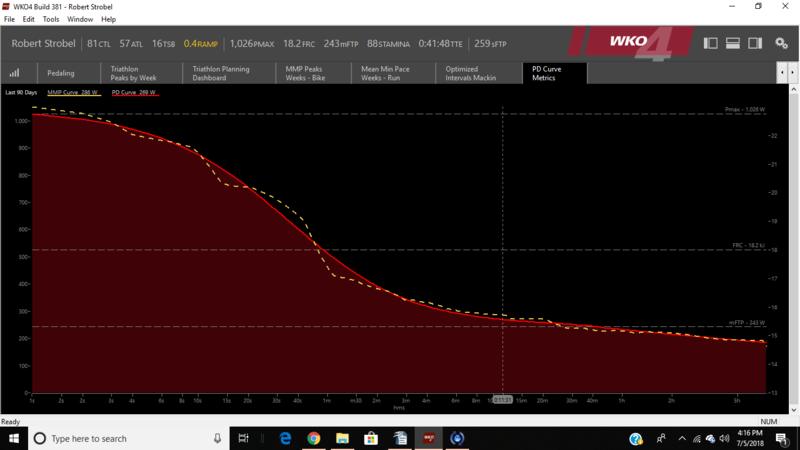 These new zones are defined by the power duration curve located in WKO4, which is modeled for each individual athlete from their mean maximal power from actual rides during the last 90 days. 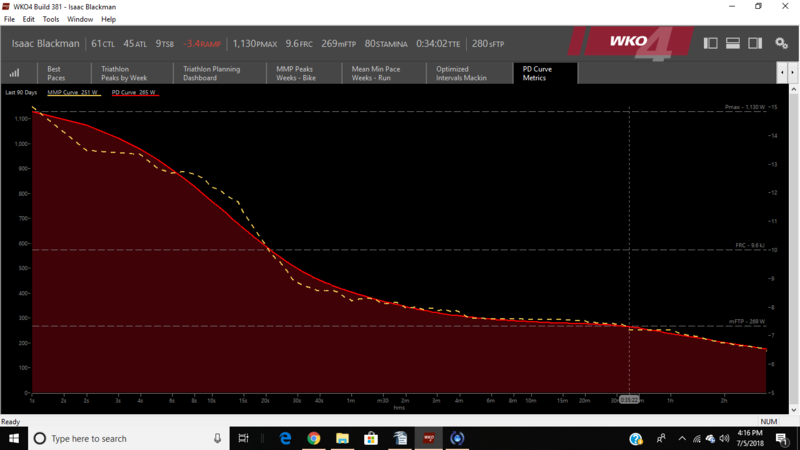 The solid red line is the PD curve and the dashed yellow line is from actual data (Mean Maximal Power, or MMP) from rides during the last 90 days. As you can see, there is a point somewhere along time time continuum that the red line “kinks” downward. That is the modeled FTP (mFTP), which typically falls somewhere between 30 and 70 minutes. The mFTP doesn’t always line up exactly with the tested FTP that I would test my athlete for every 6-8 weeks. As a triathlete, the focus of pushing up the mFTP as high as possible, is not the only goal. But also to push the “kink” to the right further down time continuum. That “kink” is known as Time to Exhaustion (TTE). As a coach, I would rather have the athlete with a mFTP 5 or 10 watts lower and have the TTE be several minutes longer. So how do we go about increasing mFTP and lengthening TTE? The trick is targeting different parts of the PD curve by trying to push the curve to the right. Good ways to do that are by doing tempo and sweet spot intervals for various lengths of time. A good place to start is 150 to 200% of TTE, depending the athlete’s ability and skill level. However, at some point your mFTP will only get so high and you have to work on the limiter known as your VO2 Max. Your VO2 Max is something that you are born with and really can only be increased about 10 to 15% with focused training. So in order to bump that mFTP a little higher when it is bumping up against your VO2 Max, you need to work the max aerobic part of the power curve, or FTP/FRC levels. After the athlete has gained enough fitness, I like to schedule these max aerobic workouts (FTP/FRC) intervals about once every 2-3 weeks. If an athlete focuses too long on their max aerobic fitness, the mFTP will begin to drop. The reverse is also true. If an athlete focuses too much on tempo, sweet spot and FTP intervals, then the VO2 max will begin to drop and limit the gains that could be made. 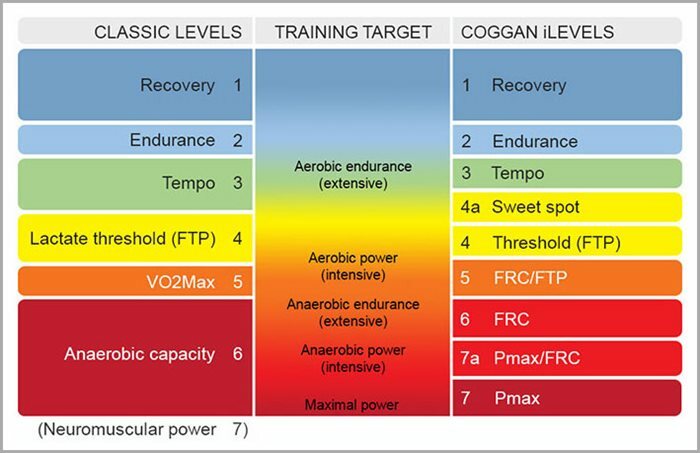 Here is a chart, using the classic Coggan Power Levels that show what is happening physiologically at each training zone. Since sweet spot percentage of mFTP remains the same in both the classic and iLevel training zones, let’s focus on that one for now. As you can see, the sweet spot produces a good amount of training response nearly across the board. As a coach, when it comes to prescribing workouts that have dose of intensity to them, I almost always have some sweet spot mixed in there somehow. So, to recap, as a triathlete a good amount of your training should take place in the power ranges of tempo, sweet spot, and FTP. Throwing in some FTP/FRP (max aerobic intervals) from time to time will help as well.